1. You will automatically receive notification of each new posting on BOOMERBROADcast as soon as it’s published. 2. 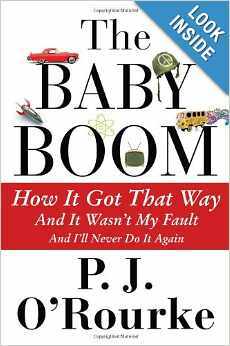 Your name will be entered into a free draw for a copy of The Baby Boom by P.J. O’Rourke, a recounting of the evolution of our generation. Find the FOLLOW button in one of two locations on my home page, depending on how it shows up on your screen. 2. In the left column below the Categories section, in a blue box that says Follow. All existing followers and new followers who join are eligible. One entry per person. Contest ends May 1, 2014. Winner’s e-mail address will be drawn May 5, 2014. Previous PostFrench women get it . . .